1. Reduce emissions from vehicles: The Canadian and US Governments established stringent fuel and vehicle emission standards that have significantly reduced emissions of air pollutants from new cars and trucks. These regulations have, and will over the next decade, produce significant emission reductions as older vehicles are replaced with new lower emitting ones. These benefits however, will be offset to some extent by the increasing number of vehicles on the road, the increasing vehicle kilometres being travelled (VKT), and the increasing traffic congestion on many roads in parts of Canada and the US. The US Government has also taken steps with its Diesel Emissions Reduction Act and National Clean Diesel Campaign to require and encourage retrofits for existing heavy-duty diesel vehicles that were built to weaker emission standards which may be on the road for many years. The US EPA has determined that this retrofit program could yield large public health benefits in a cost-effective way (US EPA, 2007). 2. Separation distances for sensitive land uses: Another approach is to establish separation distances between sensitive land uses such as homes, schools and hospitals, and high volume traffic corridors. This was recommended in a guidance document produced by the California Air Resources Board (CARB) in 1997. CARB recommended a separation distance of 500 feet (150 metres) between sensitive land uses, and freeways, urban roads with 100,000 vehicles per day, and rural roads with 50,000 vehicles per day (CARB, 1997). Several jurisdictions in the State of California have since included varying separation distances in Regulations and Guidelines to be applied when new developments and roadways are proposed (HRHD, 2009). In 2006, the British Columbia Ministry of Environment released a guidance document to be considered during the development process in communities across the province. It recommended a separate distance of 150 metres or more between buildings such as schools, hospitals, long-term care facilities and residences, and busy roads defined as those carrying more than >15,000 vehicles per day (BC MOE, 2006). 3. Promote active transportation to reduce vehicles on roads: Policies and plans that promote and support active transportation can be established to reduce the number of vehicles on traffic corridors. 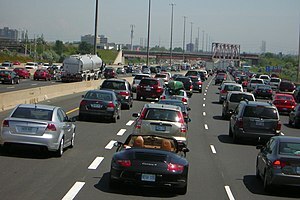 Working with air modelling experts in the Toronto Environment Office in 2007, Toronto Public Health estimated that air pollution associated with traffic gives rise to 440 premature deaths and 1,700 hospitalization per year in the City. It also estimated that if 30 to 50% of traffic in Toronto was shifted from motorized vehicles to active forms of transportation (i.e. walking, cycling, blading), approximately 200 air pollution-related deaths a year in the City could be prevented (TPH, 2007). A recent study conducted in the midwestern United States produced consistent findings. It estimated that, in a region of 31.3 million people, health benefits worth $3.5 billion could be realized from the air quality improvements that would occur if 50% of short trips (i.e. a round trip less than 8 km) were made by bicycle instead of motorized vehicles (Grabow et al, 2011). A study conducted in King County, Washington, found a 5% increase in neighbourhood walkability was associated with a 6.5% reduction in vehicle miles travelled (VMT), a 5.6% reduction in the grams of nitrogen oxides, and a 5.5% reduction in the grams of volatile organic compounds emitted, on a per person basis (Frank, LD et al., 2006). 5. Establish congestion charges or express toll roads to reduce traffic congestion and/or VKT: Congestion charges used in London UK, when paired with retrofits for transit buses within the charging zone, were associated with reductions in emissions of air pollutants and a slight improvement in air quality for several years, as a result of reduced number of vehicles and increased speeds within the charging zone (Beevers SD & DC Carslaw, 2004; Tonne et al, 2008). The introduction of an electronic toll along the New Jersey turnpike was associated with reductions in the incidence of prematurity and low birth weight among mothers living near toll plazas (Currie, 2009 as cited by Giles et al, 2010). US Environmental Protection Agency (US EPA). 2007. The Cost-Effectiveness of Heavy-Duty Diesel Retrofits and Other Mobile Emissions Reduction Projects and Programs. California Air Resources Board (CARB) & California Environmental Protection Agency. 1997. The Land Use – Air Quality Linkage: How Land Use and Transportation Affect Air Quality. Halton Region Health Department (HRHD). 2009. Protecting Health: Air Quality and Land Use Compatibility. Ministry of the Environment of British Columbia (BC MOE). 2006. Develop with Care: Environmental Guidelines for Urban and Rural Land Development in British Columbia. Environmental Best Management Practices for Urban and Rural Land Development in British Columbia: Air Quality BMPs and Supporting Information. Toronto Public Health. 2007. Air Pollution Burden of Illness from Traffic in Toronto. Grabow, Maggie, et al. 2007. Air Quality and Exercise-Related Health Benefits from Reduced Car Travel in the Midwestern United State. Environmental Heatlh Perspectives. Frank LD, JF Sallis, TL Conway, JE Chapman, BE Saelen and W Bachman. 2006. Many Pathways from Land Use to Health: Association Between Neighbourhood Walkability and Active Transportation, Body Mass Index, and Air Quality. Vol. 72;1. Tonne C et al. 2011. Air pollution and mortality benefits of the London congestion charge: spatial and social inequalities. Occupational Environ Medicine. Vol 65. Giles LV et al. 2010. From Good Intentions to Proven Interventions: Effectiveness of Actions to Reduce the Health Impacts of Air Pollution. Environmental Health Perspectives. Vol 119. This entry was posted in Active & Sustainable Transportation, Air Quality & the Built Environment, Kim Perrotta, Public Health & Land Use Planning and tagged active transportation, Air pollution, bike paths, congestion charges, Land use planning, Public health, public transit, set-backs by Kim Perrotta - Executive Director (Volunteer), Creating Health and Sustainable Environments. Bookmark the permalink. Here in Florida we build right along the highways, from time to time they will put a wall up for noise but as far as I know it is not to stop any fumes from the traffic passing by. I think that there needs to be changes in areas that have constant traffic, I would not want to be berating in fuel all day long! Having grown up in Queens, this makes complete sense. In Manhattan, people are use to not using a car for local chores, but in the Boroughs people tend to hop in their car more then they really need to. We’ll walk 20 blocks in Manhattan but drive a 1/4 mile in Jackson Queens. We need to really rethink local traffic issues and ask ourselves if this moving around in our own car in our own neiborhood, and having all our neighbors do the same thing is the real reason for our local traffic headaches? This then is not a traffic problem; it is physics. There is simply not enough pavement. And we can’t start moving buildings to make roads wider, so what options are there but to use the existing pavement to move more people more efficiently? This can only be done by accepting that to cut traffic we need more delivery services and we need to give people real options such as better bus service and biking. That means the bike lanes need to be safe (safe enough for kids to use!) and bus sevice frequent enough for people to rely on it (and not just at rush hour! ).